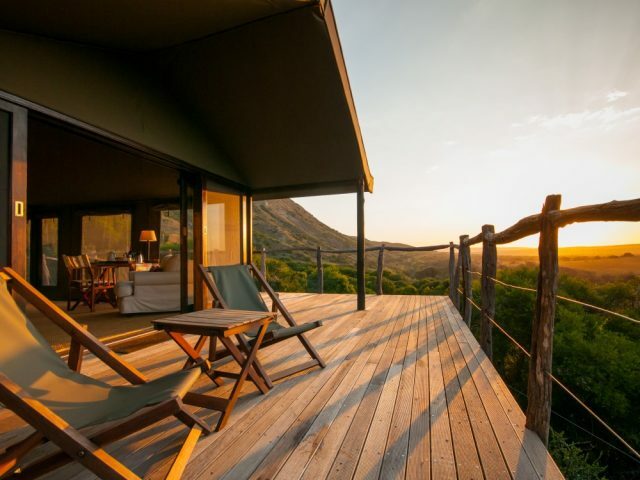 With your own comfortable viewing deck area and plunge pool overlooking the bush, you’ll be sorely tempted to spend your whole stay in and around your suite, only emerging for meals and the odd game drive! It’s the little touches that count, like hot water bottles on game drives and coming back to a just-run bubble bath, romantically lit with candles and a bottle of bubbles on ice! (although you might also be tempted by the his ‘n’ hers outdoor showers! Get an even better look at the magnificent night sky using the lodge’s telescope! Amakhala is very easily accessible, less than an hour’s drive from Port Elizabeth, so perfect for a quick weekend getaway. The game viewing experience will be compromised for some by the reminders of civilisation that you cannot avoid – for example, going under the N2 highway to get to the main game viewing area in the reserve. you can soak in a luxurious candle-lit double bath or (our favourite bit!) splash off the dust in the twin his ‘n’ hers outdoor showers with their view out onto the bush! Amakhala is a reserve of some 7500 hectares of spectacular scenery, especially around the meandering Bushman's River with its surrounding cliffs and rolling plains. Nestled between Shamwari Game Reserve and Addo Elephant Park, Amakhala Safari Lodge is tucked away in a valley of indigenous bush at the northern boundary of the Amakhala reserve – it’s one of a collection of some 11 lodges in the reserve, most of them still owned by 5th generation Frontier settler families who originally arrived in this part of the world almost 200 years ago from England. Whilst the lodges in the reserve range from basic tented bush camps through old settler farmhouses all the way to modern 5 Star luxury lodges, it is perhaps Safari Lodge which has the strongest African feel to it courtesy of tribal-inspired architecture. The signature styling feature has to be the attractive stone spires that adorn all of the lodges thatch roofs that bring to mind elements of the ancient West African desert cities like Timbuktu! 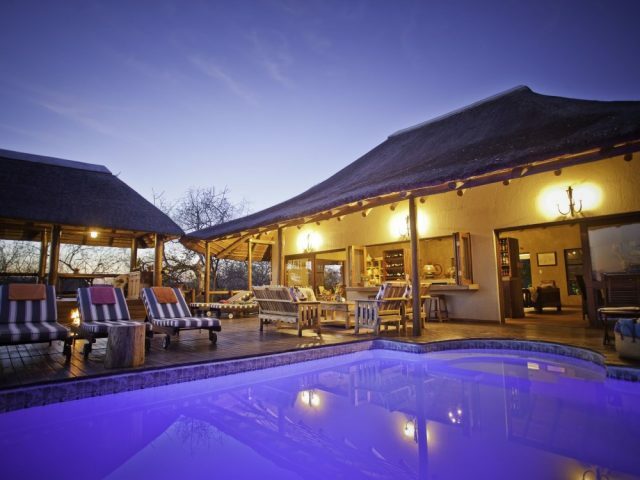 Amakhala Safari Lodge consists of 11 well- appointed and richly furnished suites overlooking the bush and a waterhole in the north-western sector of the reserve. The suites are an unusual blend of conventional room and tent in that the front of the room is basically wide open – rather than a normal wall there are canvas drop blinds which can be lowered to keep out the elements. 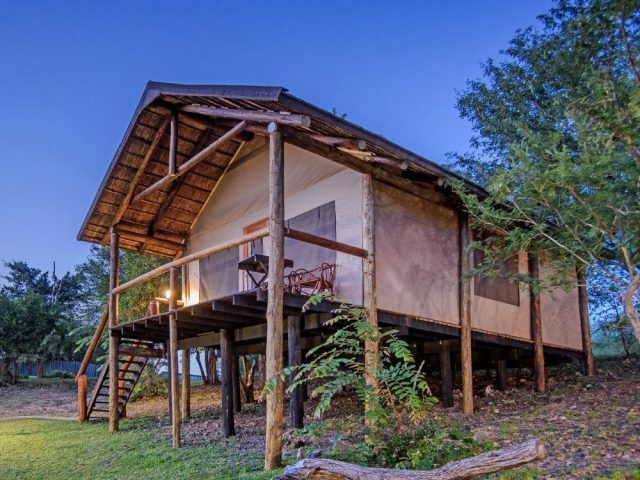 This really gives the suites a wonderful feeling of being connected with the wild, especially those rooms which look out on an active waterhole barely 30 metres away – you can simply lie on your bed and look out at the animals grazing quietly in the nearby bush. 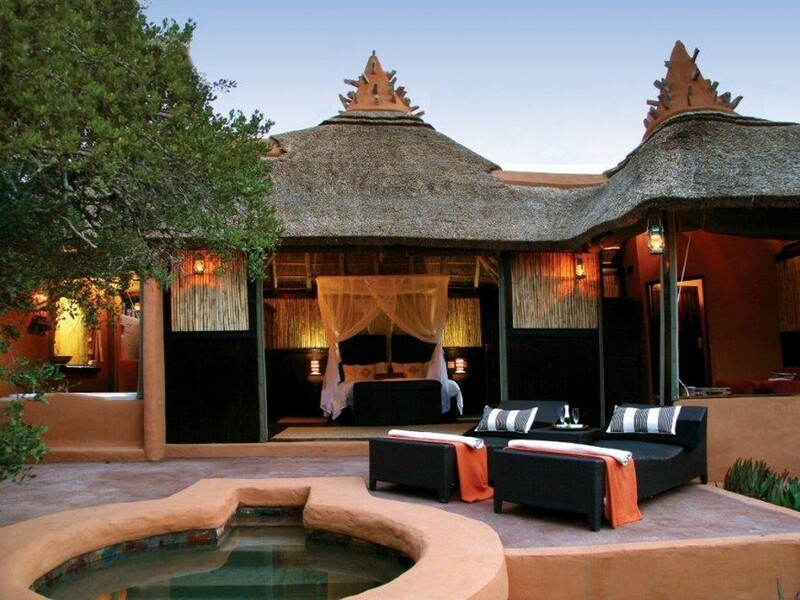 Whilst African tribal design may have inspired owners Mike and Justine Weeks in the creation of these thatched suites with their rustic finishes including cement screed floors and reed walls, they also feature modern creature comforts that old tribal kings could have only dreamed about! You get air-conditioning for example, a separate lounge area, a comfortable king size bed covered with romantic mosquito netting and even under-floor heating. You can soak in a luxurious double bath or (our favourite bit!) splash off the dust in the twin his ‘n’ hers outdoor showers with their view out onto the bush! And just in case you need any more convincing that a stay here is perfect for romance, each suite even has its own private plunge pool on the outside viewing deck – it really is a place where you’re tempted to disappear into your suite for the entire weekend, just emerging every now and then for a meal or game drive! Back at the main lodge, it’s a very similar style that prevails with the lounge area also having those canvas drop blinds so that it is completely open to the views of the bush unless the weather gets dodgy. Sweeping decks provide the perfect vantage point to views of a small waterhole where monkeys come to play and antelope and zebra arrive quietly to quench their thirst. Back at the lodge after your game drive, you can enjoy a massage with the lodge’s therapist, work on that tan on your deck chairs at your private splash pool, or have a cocktail with the other guests at the main pool area whilst sharing photos and experiences. The main lodge has a lovely boma area where guests can relax around the fire after their evening meal and exchange safari stories, and there is also a telescope set up in a mini-observatory for those interested in star-gazing. Talking of meals, the lodge prides itself on the high quality of the food and you certainly won’t go hungry, what with a cold and warm breakfast, light lunch, lovely platter for sundowners and delicious three course dinner on offer! 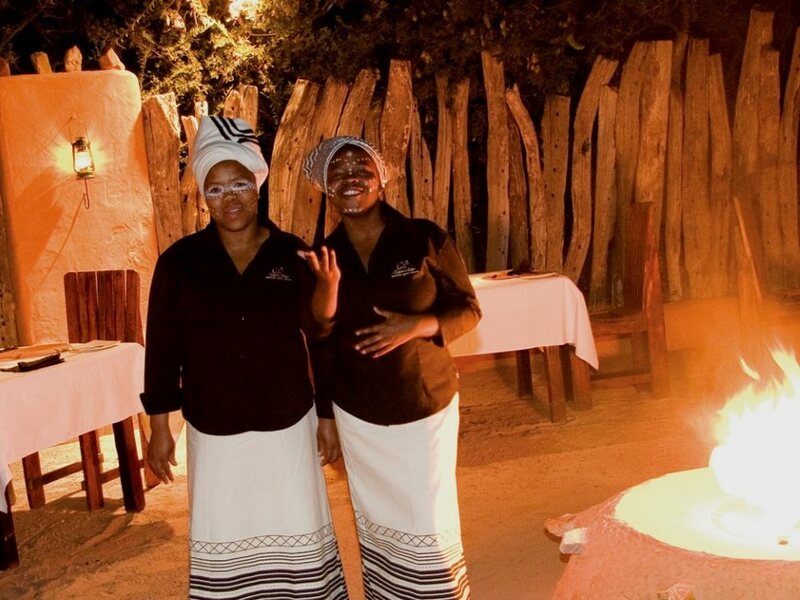 In the evening the haunting sound of the kudu horn will summon you to the fireside, to share tales of your day’s adventure and to enjoy a memorable meal under a magnificent canopy of stars. Safari Lodge does two game drives a day on the Amakhala reserve (and they can also take you to nearby Addo if you fancy seeing more elephants than you can shake a stick at!) Nice little touches include the lodge giving out hot water bottles and blankets before you embark on those chilly morning game drives in winter! One thing to note is that Safari Lodge is on the parcel of the reserve north of the N2, so you take a tunnel under the highway in order to get to the heart of the reserve for game viewing purposes. Whilst Amakhala is obviously a small reserve compared to the massive tracts of unfenced land in the greater Kruger area for example, this does have the advantage in that game viewing is pretty consistent as a result – chances are that you are going to see most of the major species that are there, with just the more elusive species like leopard and hyena being harder to spot (the reserve prides itself on excellent cheetah and elephant sightings by the way) On your return to the lodge you’ll find your double bath surrounded by romantic candles and filled with aromatherapy scented bubbles with a bottle of bubbles on ice alongside – no wonder Safari Lodge is a favourite for honeymooners and the romantic at heart!